We have been on a peach kick lately. 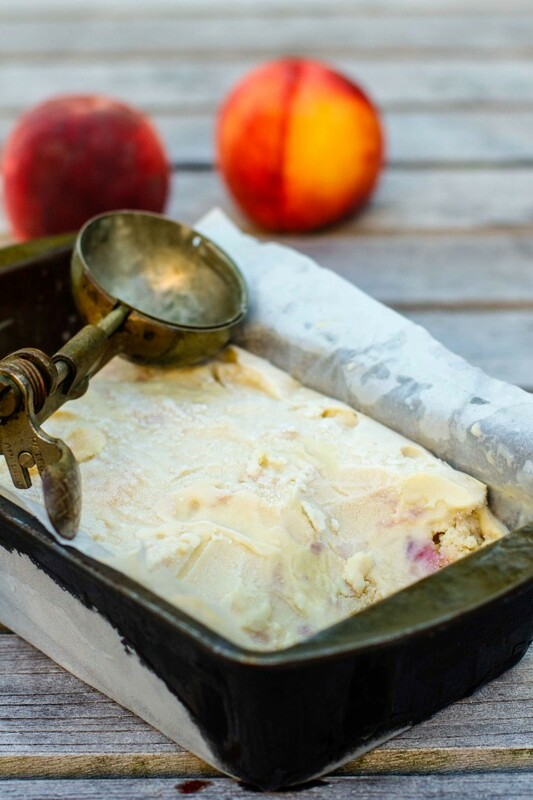 In addition to this Roasted Peach and Lemon Thyme Paleo Ice Cream, there’s been Peach Breakfast Cake, Roasted Tomatillo Peach Salsa and Vanilla Peach Freezer Jam. 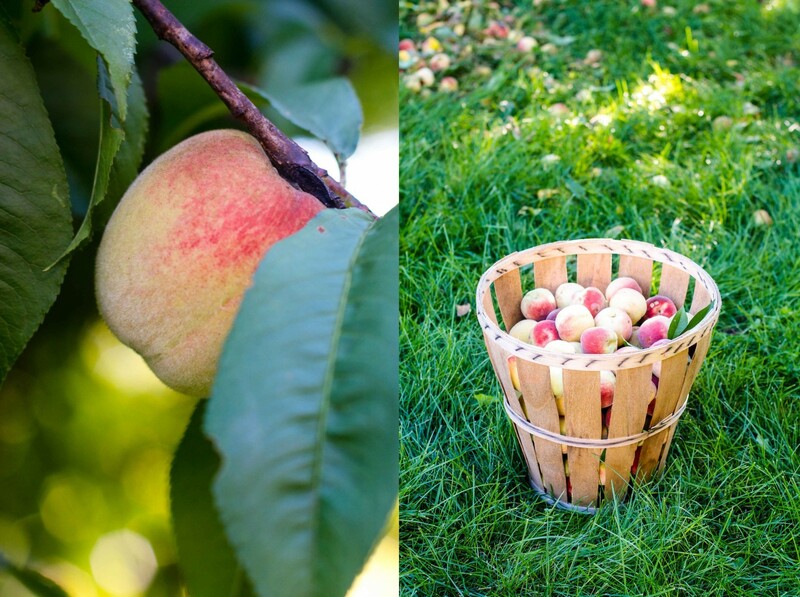 The peach tree in our backyard has been very “fruitful” this year and we have taken full advantage. Not being professional fruit pickers we had to resort to some primitive methods of reaching the peaches high in the tree. 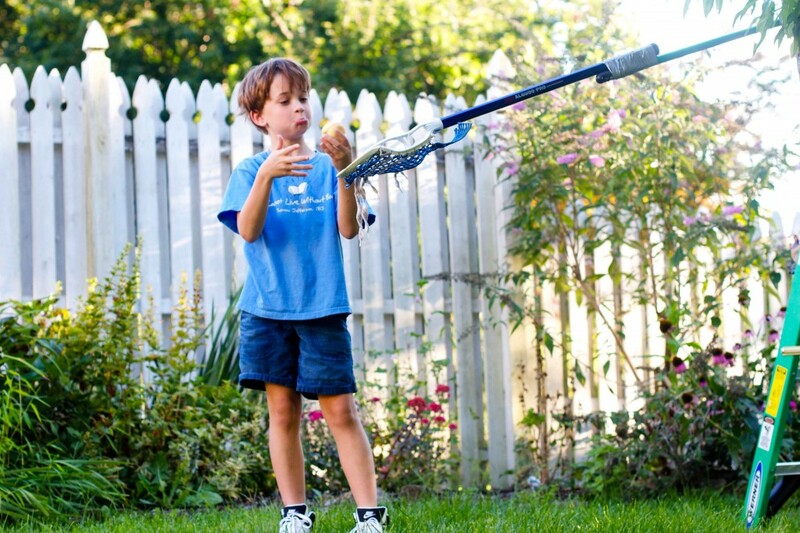 Behold the “Lacrosse stick-broom handle-peach picker”. In spite of our primitive methods we were pretty pleased with the harvest. 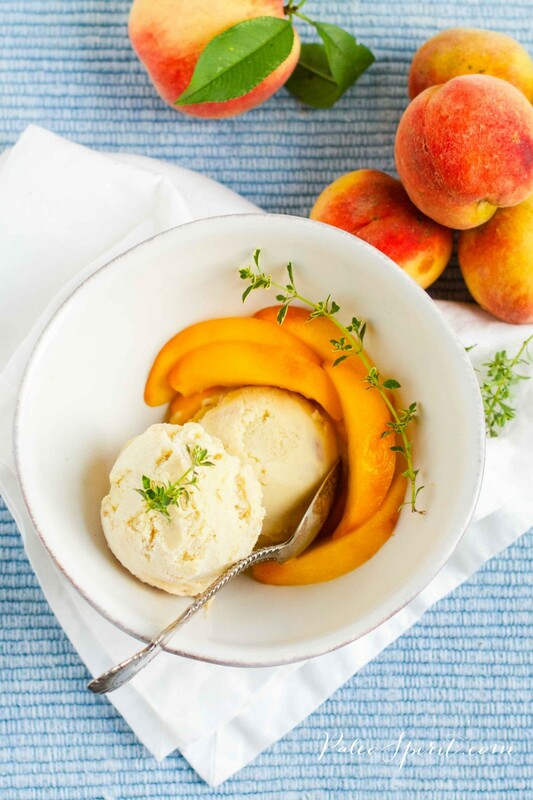 Although to make all these recipes we definitely made use of farm stand peaches this summer. 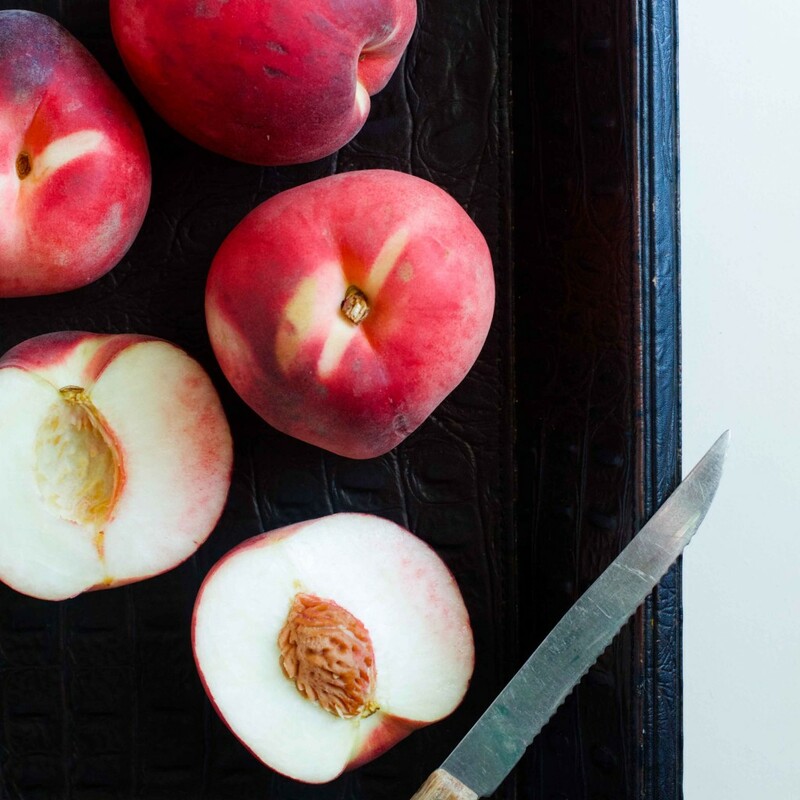 Yellow peaches have always been my favorite but white peaches have their own beauty. In order to make the ice cream I roasted a few of these beauties. Before roasting the peaches I cut them up and placed them, skin on, in a baking dish, drizzled honey on them and roasted the peaches until they were soft and the skin peeled right off. The house smelled absolutely heavenly. While the peaches were roasting I harvested the Lemon Thyme from our garden. 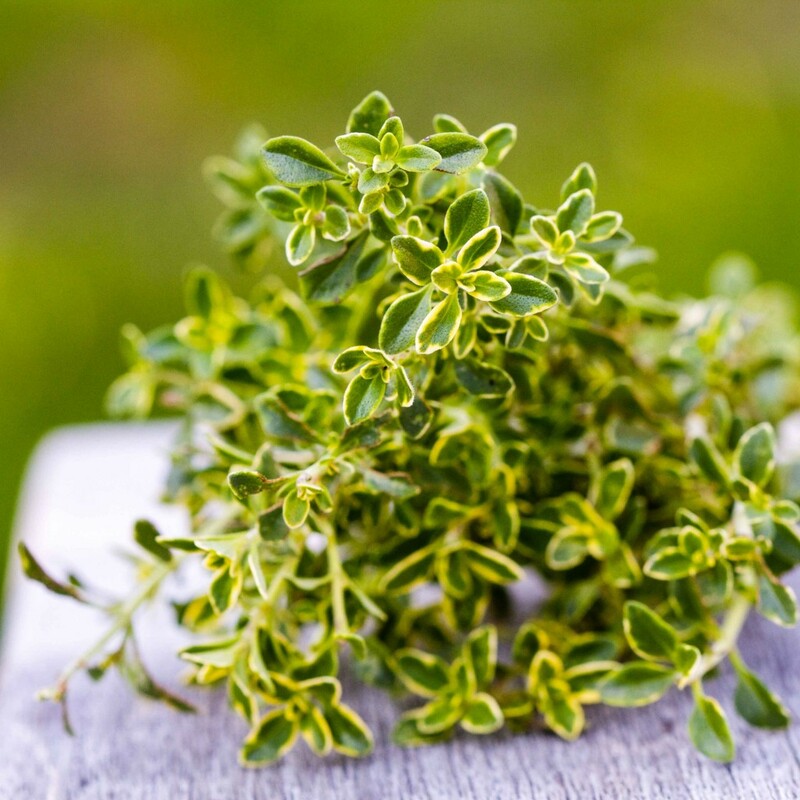 It has an unusual flavor – a variation of regular thyme but, as you can imagine, with a strong lemony scent. The leaves are tinted with golden edges setting it apart from its more ordinary cousin. When making the coconut milk ice cream I decided to use egg yolks to create more of a custard for a creamier, less icy end product. The hot coconut milk was infused with the lemon thyme goodness and honey, then used to temper the eggs to create the custard. The soft roasted peaches were relieved of their skins and smashed with a fork then added to the lemon thyme infused custard. The peach and coconut milk custard mixture then was added to our ice cream maker and processed until we had a thick, peachy summer treat. We lined a bread pan with parchment and froze the ice cream for a few hours before serving. 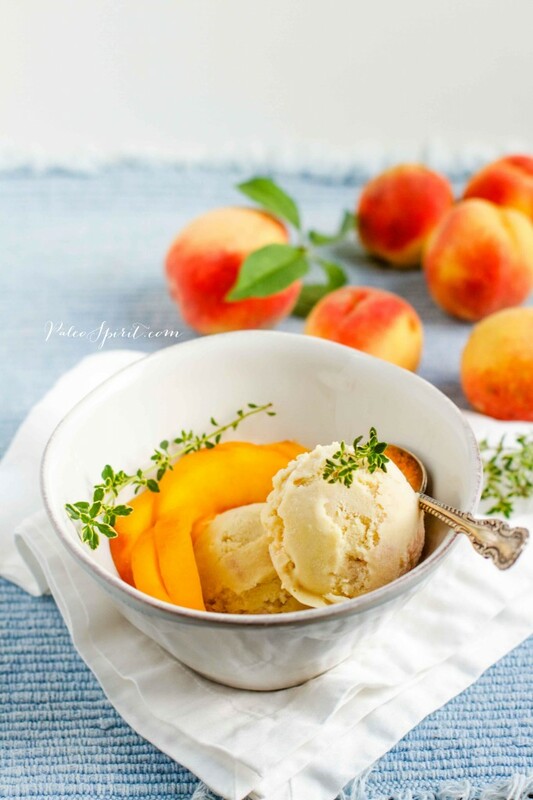 The Peach and Lemon Thyme Paleo Ice Cream was served with some fresh peaches. Refreshing. 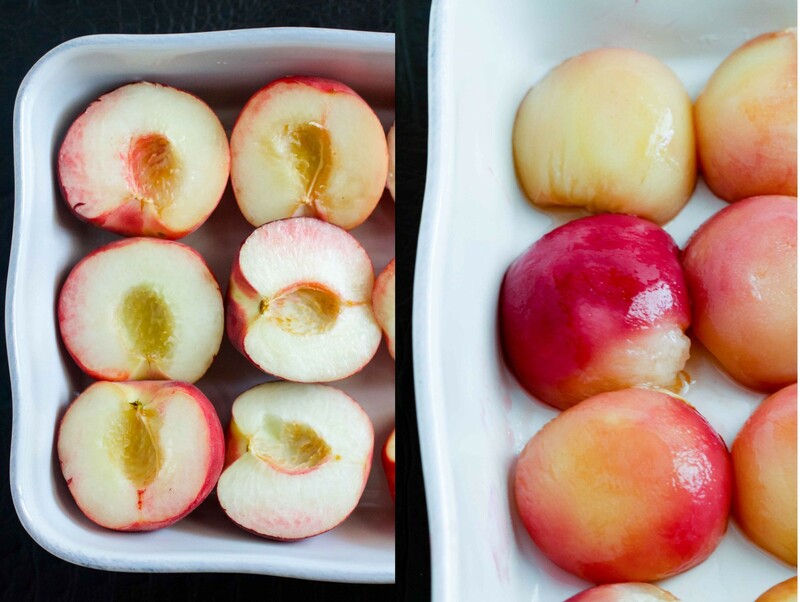 Cut the peaches in half, remove the pits and place in a roasting pan, cut side up. Drizzle with 1 tablespoon of honey and roast until soft, 30-40 minutes. Let cool completely and peel the skins off the peaches. 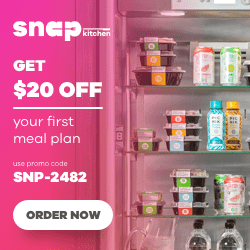 Smash the peaches with a fork or potato masher – no need to puree fine. Cover and refrigerate. In a medium sauce pan, combine the coconut milk, honey, vanilla and lemon thyme and bring to barely a simmer. Remove from the heat. In a separate bowl, whisk the egg yolks until frothy. Pour about a fourth of the hot coconut milk mixture into the egg yolks, whisking constantly. Then pour the combined egg yolk/coconut mixture back into the saucepan with the rest of the coconut milk mixture. while whisking, until somewhat thickened – about 5 minutes. Remove from the heat and cool for a few minutes. Strain the custard through a fine sieve to remove the thyme and any lumps. Refrigerate custard until completely cooled. Alternatively, you can use an ice bath to cool the custard off even faster before refrigerating. 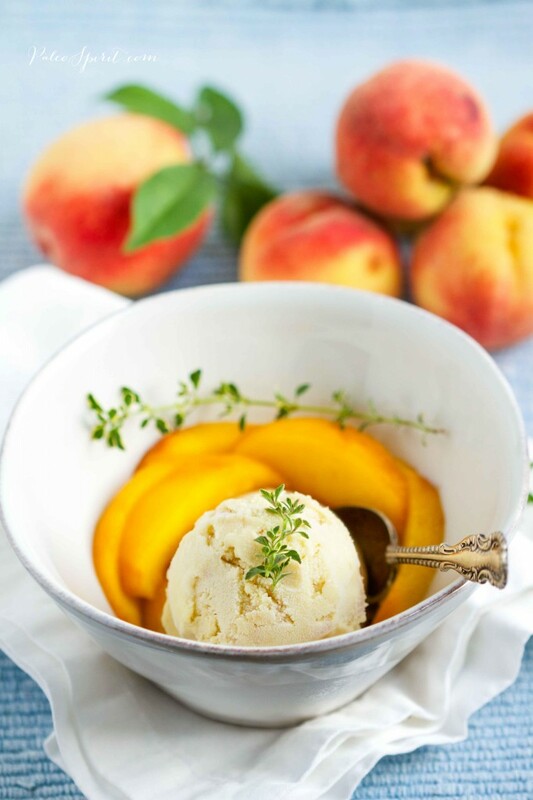 Once they are both chilled, add the peaches into the custard base and process the ice cream according to your ice cream maker manufacturer’s instruction. 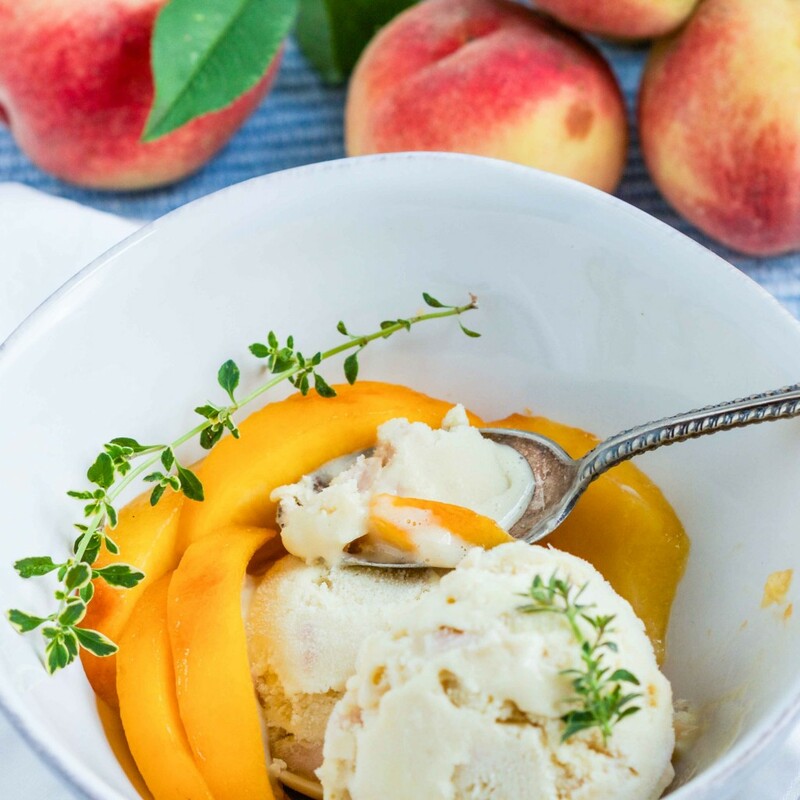 How have you used peaches this summer? 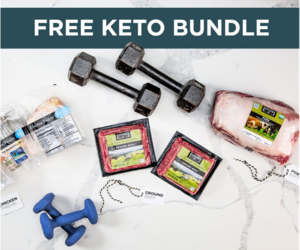 Do you have a favorite paleo ice cream? If you eat dairy you might like my recipe for Rum Raisin Ice Cream or Honey Yogurt Gelato with Roasted Strawberry Sauce. 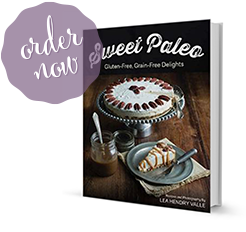 For more paleo dessert recipes check here. 6 Responses to "Roasted Peach and Lemon Thyme Ice Cream (Paleo & Dairy-free)"
I’ll be making this tomorrow after I get off work! Can’t wait!!! Combine the ingredients for your ice cream mixture following the recipe. Chill the mixture over an ice bath. Meanwhile, freeze an empty freezer-safe shallow bowl or pan. Stainless steel works well for this. Place the cold mixture into the cold pan. Chill for about 20 minutes and check your ice cream. As the edges start to freeze, stir the mixture rapidly with a whisk or spatula to break up the partially frozen ice cream. This will help make it smooth and creamy. You cannot over-beat. Return to the freezer. Stir ice cream vigorously every 30 minutes until it is firmly frozen. This may be repeated 4 to 5 times until mixture is smooth and creamy. If ice cream becomes too hard, place it into the refrigerator until it becomes soft enough to beat and continue the process.